This jawsome free resource is a sentence to picture matching game, great for a reading center! 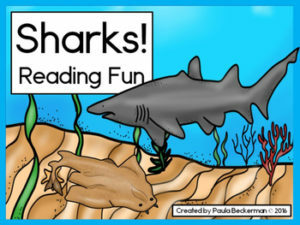 It includes a poster of 10 common sharks, plus 12 sentences and pictures for your students to match. With a focus on preprimer and primer sight words, you can use this resource with children reading on a kindergarten or first grade level. Best of all, it’s both free and easy to prepare: print, laminate, and trim on straight lines!